I was sitting here tonight alone with my thoughts, my reverie, my memories, looking back on people and days gone by. Not sure how it happened but I suddenly realized that today is the anniversary of the famous (or is that maybe infamous) San Quentin album. 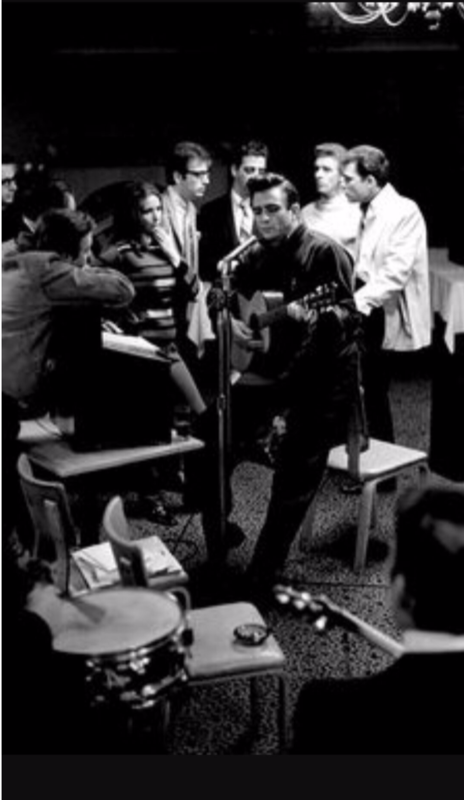 It was the Johnny Cash follow up to the Folsom Prison album and it was recorded on February 24, 1969 – exactly forty-eight (48) years ago today. We were there for both albums and all the other albums that John cut from ’64-’72. But San Quentin is the one I’m focused on tonight. People always asked how it felt inside the walls and I’m always hard-pressed to be able to give a true and effective answer. It was certainly chilling to have those huge iron gates clang shut behind you every six feet when you first went in. It was a disturbing scent that permeated the building the entire time you were there. You never got used to it and when you finally did get out in the fresh air, you never forgot it or forgot those who couldn’t get away from it. And the faces stayed with you for years. They were hard and desperate faces and even in the meanest and coldest of them you could see a hint of fear. Such a strange and unsettling mixture in the heart and souls of these men. Some were too young and some were too old. And the only word that described them all was sadness. But this particular day they were loud and boisterous and ready to be entertained. We all sang them hits and gospel songs and the more they yelped the more we sang and the faster the music got. This was the afternoon “A Boy Named Sue” was born. We stood on the side of the stage and watched Carl Perkins and The Tennessee Three play live, a song they had never heard before. We and they laughed throughout every missed chord and rhythm goof. Listen close and you’ll see nothing was ever redone or fixed. All the mistakes stayed on the record just the way it was cut and it became one of the biggest songs of the year. Go figure. For all the years we were with the Cash Show (8 ½ to be exact), I emceed all the shows and brought on all the individual acts. I always introduced John until he hit on that “Hello, I’m Johnny Cash” classic intro. Every night he would tell me as we stood in the wings waiting for his music to start, he’d say, “Donnie, (he was the only person besides my mother who ever called me Donnie) be sure to tell ‘em how I got that scar.” And he’d run his finger on the side of his face where he had a deep welt from a childhood accident. It was our little joke meaning it was time to go and get this show on the road. Matter of fact, at the end of the San Quentin album you can hear my 24 year-old-self taking him and all the cast off stage over top of the playoff music. 24 year-old-self? 48 years ago? Where did these numbers come from and could this really be me I’m talking about? This is too much remembering for one night. Have a good evening. We’ll talk later.